What's The Difference Between Rimfire and Centerfire Ammo? This cutaway picture of the two side by side shows the difference in the two ammo variations. 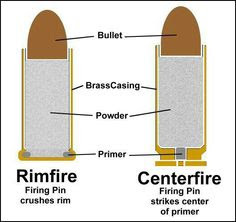 In the centerfire the firing pin strikes the primer located in the center of the cartridge base and in rimfire the firing pin crushes the primer located in the outer rim of the base.